No surprise, the first and biggest reveal of the day was Google‘s new flagship phone, the Pixel 3 and its bigger brother, the XL. This oft-leaked phone comes with wireless charging and the addition of a wide-angle front-facing camera. Both Pixel 3s boast multiple improvements to the camera software, including Top Shot, which uses AI to avoid common photography mishaps such as blur; Night Sight, which allegedly eliminates the need for flash even in low-light; and Super Res Zoom, which is designed to keep images sharp even when the camera is zoomed in. The Pixel 3 and Pixel 3 XL will be available on October 18. The upgraded version of Google‘s Home speaker comes with a touchscreen tablet. The Hub is designed to be, as the name indicates, a node through which you can control all of your smart home devices, down to individual rooms. To ensure it’s something users can be comfortable having in any room, it doesn’t come with any cameras and automatically adjusts its lighting to the space. The Hub comes integrated with Nest, and also offers Live Albums to display when it’s not being used. It comes in four colors and is currently available for pre-order with a $149 price tag. 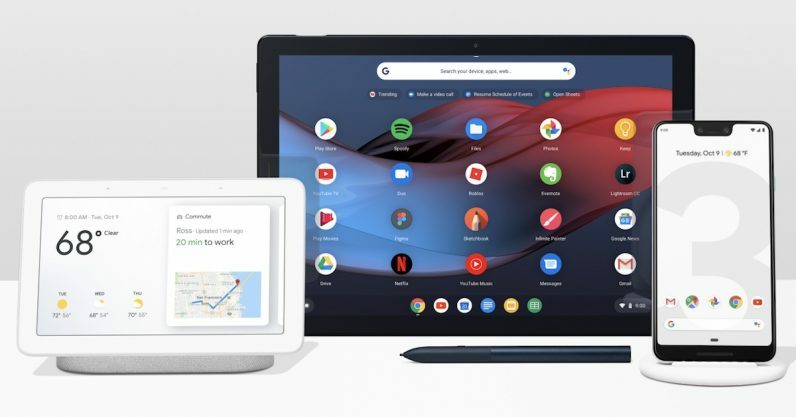 The Pixel Slate is Google’s first 2-in-1 tablet since the Pixel C, and the first one to run Chrome OS. The updated OS switches seamlessly between desktop and tablet modes, and offers a full compliment of Android apps via the Play Store. Google also showed off the Slate keyboard, a detachable folio with rounded buttons, complete with trackpad. It also works with the Pixelbook Pen. The Pixel Slate will be available in four configurations, starting at the price of $599. The keyboard will be available for $199, and the pen will set you back $99. The Pixel Stand, along with the Hub, is part of Google’s continued push into making devices for a smart — or, to use its word, “thoughtful” — home. While most phones have some form of call screening, Google today announced its Duplex AI would do even more to save you from having to deal with pesky telemarketers. When enabled, the AI answers a call on your behalf and allows the caller to state their intentions. Once the caller has given their name and a message, the AI transcribes it and delivers it to you. That way, you can decide whether or not you want to answer, or to ignore the caller. The feature will roll out sometime next month. It’s not a massive improvement over the previous model. It boasts a 15 percent improvement in hardware speed, which lets it play back 1080p video at 60fps (as opposed to 720p). You’ll still need to buy the $69 Chromecast ultra for 4K and HDR. Still, it offers a small upgrade over the original at the same price of $35, and now comes in white and charcoal.